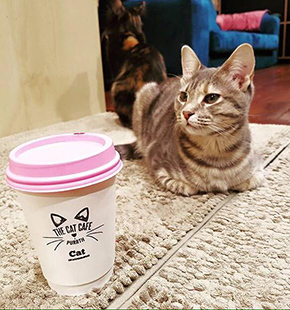 The team behind Western Australia’s very first cat cafe hopes to offer a special blend of animal welfare and human happiness, writes Wendy Williams in this week’s Spotlight on Social Enterprise. “We rescue cats and we make people happy,” says Christopher Mewburn summing up his social enterprise in one sentence. 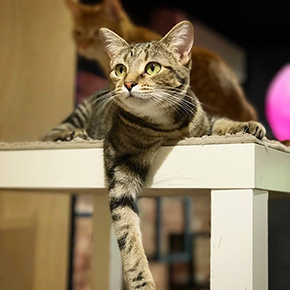 Mewburn is the director and co founder of The Cat Cafe in “Puurth”, the first cat cafe in Western Australia, which is home to 12 furry “permanent residents” who were rescued from partner organisation Cat Haven. Customers are able spend either one hour, or half an hour with the cafe’s felines while enjoying a coffee, cake, or something from the pick’n’mix lolly wall, with all proceeds supporting animal welfare. Mewburn told Pro Bono News the vision was two fold – for animal welfare and for human happiness. “So for the animal welfare side of it we directly partner with Perth Cat Haven,” Mewburn says. “They got about 7,000 cats last year and a lot of people don’t know about that, so there is a big problem with awareness and there is huge stigma, that just because they are rescue cats they are damaged goods. So a big part of what we’re doing here is showing people that they are perfectly, affectionate, loving creatures that are good pets for everyone. “There is also good pet care. We try and show people how to treat cats properly, educate them. So we partner with Perth Cat Hospital as well and we also teach people essentially how to love their cats properly. “Then there is the human happiness side of it. “We have positioned ourselves in Subiaco. It has got nursing homes up the hill, it has got our children’s hospital around the corner, and then there are lots of people with disability who live in the area, so we get those people in. We have got resident cats on site, so essentially they will get to see the same cats all the time and get to see them grow up as if they are their own cats. But Mewburn says the idea to start a social enterprise originally stemmed from a feeling of disenfranchisement that he and his partner experienced in their careers. “There are a few different factors that went into it, both my partner and I are architects and by the time we graduated after six years of study and started working, we were a little bit disenfranchised,” he says. “You spend a lot of time talking about this $20,000 bathtub and this $15,000 tap and all this sort of stuff that really, at the end of the day, wasn’t fulfilling us socially. 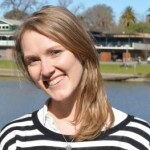 “My partner and I used to run a charity organisation in youth suicide prevention and we were very familiar with the fact that in Western Australia there was a big issue with donor fatigue so we had become very interested in social enterprise, this idea that instead of asking for a handout, you provide a service and use the profits for good. “Then we saw, after knowing about cat cafes in Japan, the first one came to Melbourne so we flew over to Melbourne to see what it was all about, and then realised pretty quickly that we could tick off a lot of our goals by opening the first social enterprise cat cafe. Mewburn says they had originally planned on opening the cafe on a bigger scale but they had to shift the business model early on after struggling to find a venue. “We were not knocked back by landlords, by insurance companies, by banks and by councils,” he says. “The logic with a landlord is that they want someone who is going to be there five to 10 years preferably 20, where there is not going to be any gap in income, when they are looking for new tenants, so any time someone comes to them with a new idea they get fearful it is only going to last for a year and they’ll be out of rent again. “So honestly, without hyperbole, it must have been 20 different landlords that we sat down with and went through the whole process and made an offer and did everything to a point where someone even accepted our offer financially, we accepted their over-the-price terms and they still pulled out at the end because they were nervous about the cats. “The saving grace was a family friend who is now retired and is looking to give back and he owned some commercial properties and wanted to help us out and he decided that he would give us a go and we were very fortunate in that. Mewburn says social enterprise is the right balance between business and charity. “Social enterprise in the venn diagram, sits right in the middle for me,” he says. “With not for profit, you spend so much time and uphill battles trying to run events and get people to come along and make big donations and bequeathments and all these things and every year it is just a struggle to fill that cheque. Then there is all that pressure of spending money in the right place and HR and all those things. “On the other side you have a business, and it wouldn’t fulfill me socially to just make money and take advantage of these cats without doing something to help them and their siblings out there that need more help. The cafe, which is broken up by a floor to ceiling glazing wall separating the space into a functioning cafe on one side and “the equivalent of a petting zoo” on the other, opened eight months ago. Already tens of thousands of people have walked through the (airlock) doors to play with the cats. Mewburn says it is attracting a wide range of people from young families on the weekends, to millennials, to students on the weekdays and even expats who have come from overseas and can’t get their own cats. “What we’re most proud of is people with disability coming through, that we don’t charge anything for, and then we have elderly people coming in from the nursing homes as well,” he says. “It is pretty amazing actually. We have got some numbers now that we have been open longer than six months. In the first six months we had 32,000 people go through the cat cafe, into the area of the cats, so paying customers. And we are thinking it is about four times that in terms of people that actually stand outside from what we can estimate. So for numbers in terms of impact, that means it is 100,000 people that know a little bit more about animal welfare just by us being here so we are very pleased with that. He says the highlights so far have been in making a difference to their regular customers. “There is one group of customers that have turned their Sunday night into a family get together and they hire out the cafe every Sunday night, they come together and they have been 50 times since we opened, so they are fantastic and they love this place it is essentially a home for them,” he says. Mewburn says their next goal is to open another cafe. “At least one more, where we can be the size we originally intended and that would be about three or four times the size of this, so we can have both resident and adoptive cats and we can start getting cats rescued directly through us as well which is our grand intent,” he says. But the long term goal it to save as many animals as possible. 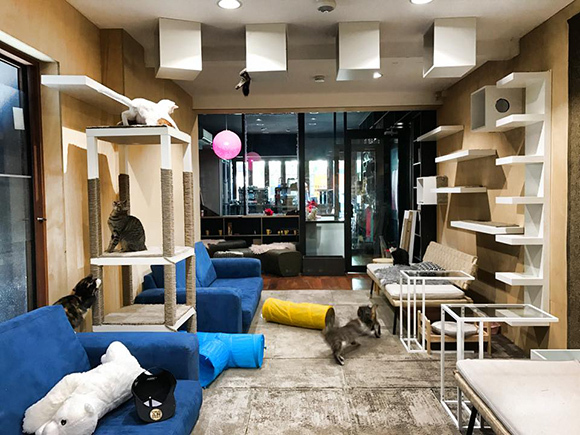 “Both my partner and I are cat fans obviously, now having 12 cats on the premises, but it is something that we knew would be more achievable than a dog cafe. Long term, we do plan to rescue as many animals as possible,” he says. “We started with the cat cafe because it seemed like an easy model, then we will move onto dogs and hopefully onto native Australian wildlife as well. More information on The Cat Cafe can be found on the website. Bookings are essential.